Delightfully crafted in the shape of a cake slice, the case features the adorable Sweet Cake artwork on the top, with candy pink stripes and polka dots decorating the sides. 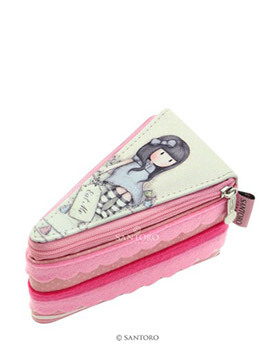 Open the spoon shaped zip embellishment to reveal a striped interior lining and ample space for small accessories such as coins, earphones, crafting items and jewellery. Charmingly sweet and oh-so unique, it is the perfect addition to any accessory collection!